Thank you for visiting Classic Sinatra, we are passionate about bringing to you the best Frank Sinatra Tribute Experience in the UK. Please feel free to call me or any member of my team for a free demonstration CD and a 12 page colour brochure anytime. You will be under no obligation, we will be happy to help you plan your event from it's conception right through to it's final stages. We are flexible with our prices, and work to the highest possible standards. 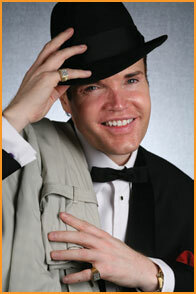 There is no other Frank Sinatra Tribute show that is more committed to making your event perfect. So give us a call on 01268 412806 or 07768-872587 & let's bring the "Pack" back today. At Classic Sinatra myself and my team pride ourselves on our attention to detail, our professionalism will bring you the ultimate Frank Sinatra experience. Our focus is always your event, our passion and dedication is your guarantee of success. At Classic Sinatra we will hit the right note every time.